Downhill the summer hotness at Alyeska, Girdwood. 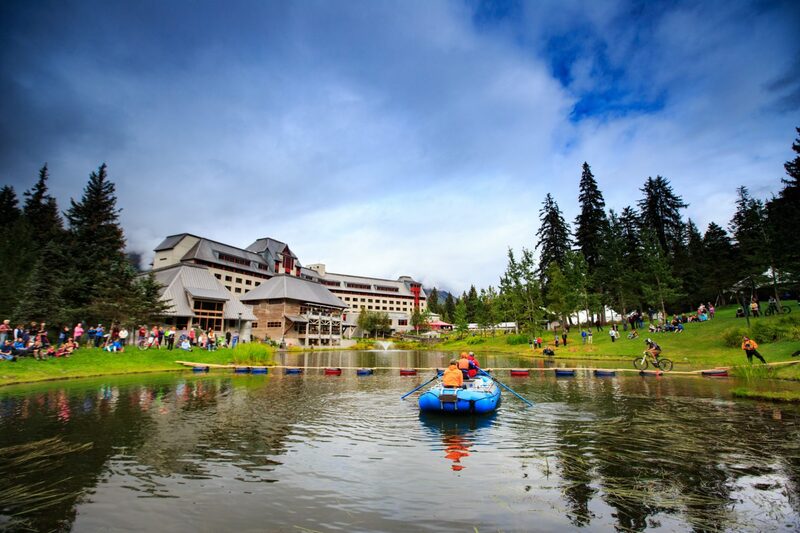 Get ready to up-gear as renowned frontier destination Alyeska Resort, and surrounding Girdwood Valley, peddle into summer bike action. Ranked among the Great Land’s premier recreation destinations, Girdwood (and its principle topographical feature) is home to the state’s largest commercial downhill operation in Alyeska Resort as well as emerging NPO, Girdwood Mountain Bike Alliance[GMBA]. The latter appeals with its refreshing, grassroots approach to kilometers of pristine Great Land trail while Mt. Alyeska proper boasts the state’s only lift-enabled gravity bike network, carving 2400 vertical feet of all ability terrain. Chairlift, Bear Cub Quad (background) accesses lower mountain Bike Park trails. 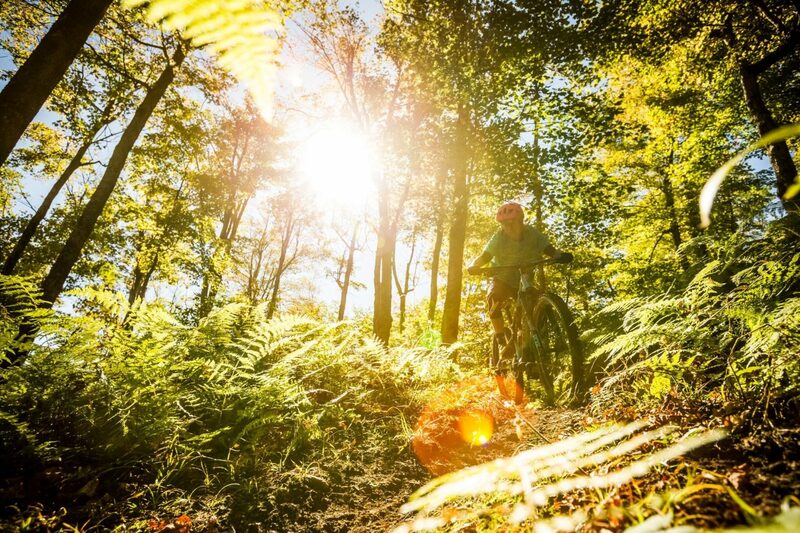 Bike Park comprises three lifts accessing twenty-four trails and operates through afternoon and evening hours over weekends-plus-holidays from June thru September, summer, 2018. “From steep, tight and technical; to flow-y cruisers, jump lines and man-made features; Bike Park has something for all ability levels,” said Alyeska Resort’s Mountain Marketing Manager, Ben Napolitano. 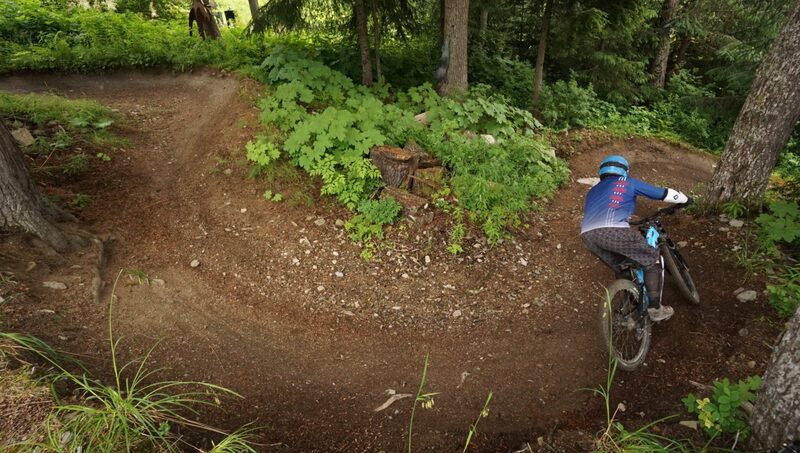 A seasoned veteran of Alyeska and Girdwood bike culture, Ben views the valley’s brand of bi-wheeled summer fun as another great way for downhill enthusiasts to get out and enjoy Alyeska Resort while providing challenging terrain for biking that grows as snows recede. “I guess what first comes to mind is the adrenaline rush that you get from it,” she said. 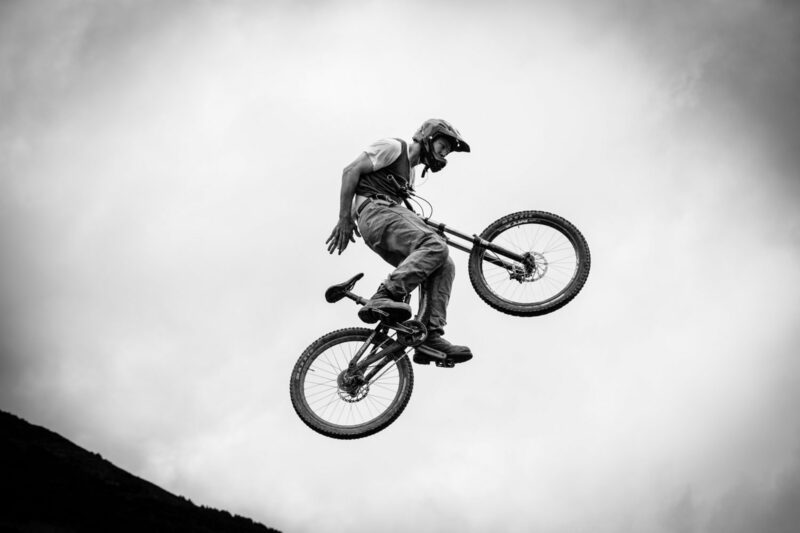 Jumping for joy at Alyeska Bike Park. The thrills begin at lift Bear Cub Quad before expanding to Ted’s Express and, ultimately, upwards to the mountain’s top-most chair, Glacier Bowl Express. 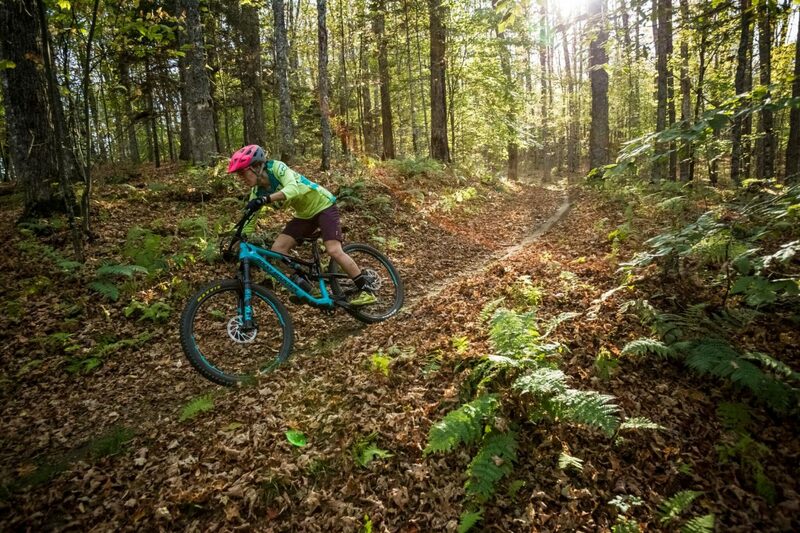 Summer 2018 entices especially, as Bike Park plans also include the creation of a new trail. Intended to launch from the top station of Ted’s Express, the still on-going project will emulate the park’s current downhill trail style, opening new zones across notorious Max’s Mountain, and is evidence of Alyeska Resort’s keen interest in the overall progression of valley bike amenities. 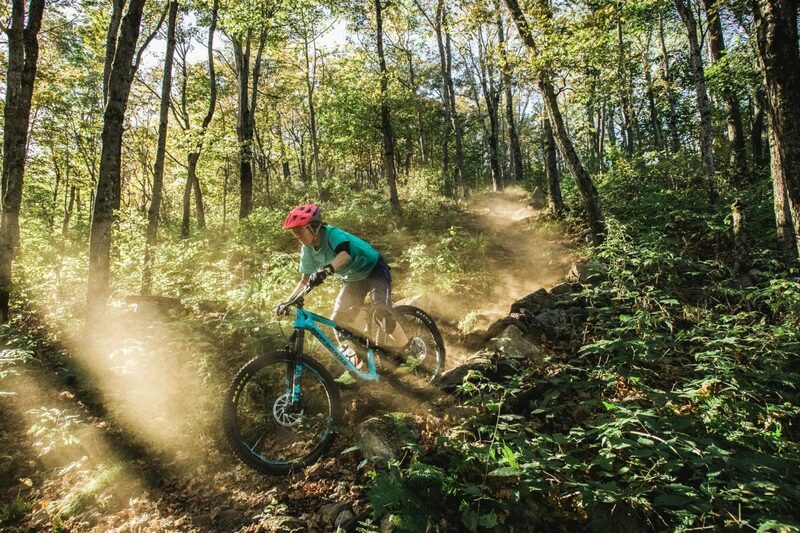 In its seventh operating year, continued Bike Park development is the enjoyable result of committed efforts by the company’s Mountain Operations and Ownership facets. Trails Crew buffs the downhill routes regularly while also constructing the mountain’s dirt and wood-formed features. Meanwhile, summer lifties are on station to facilitate rider access to those very routes. Those chair crews not only man the spinning bull wheels but also offer riders optional valet-esque gear off-loads. Jen, whose downhill experience includes trail networks at California and British Columbia, describes Bike Park atmosphere as homey, an invigorating set-up, but with family feel. The resort, itself, is a member of International Mountain Bike Association as well as corporate partner to stalwart manufacturer, Kona Bikes. And with the gravity chasing new-comer in mind, Bike Park also offers fun, safe learn-to-ride lessons from professionally certified mountain bike instructors. Rush hour on Mt. Alyeska, Girdwood. The downhill trails, which are closed to foot traffic, rise to prime riding conditions as well as begin to receive peak visitorship typically by end June. That crowd draw is owed, in part, is the schedule of spectacles hosted at the Park. The Hotel at Alyeska and site to the now notorious, Pond Crossing. “The season concludes with a four day bike festival that features daily events including the infamous Pond Crossing,” he said. Amenity to answer the eager public interest generated by Bike Park is equally well-conceived in the form of a Daylodge Bike Hub at Mt. Alyeska base area. According to Resort representatives, the station is a one-stop contact for ticketing, season passes, rentals, lessons, or repairs. 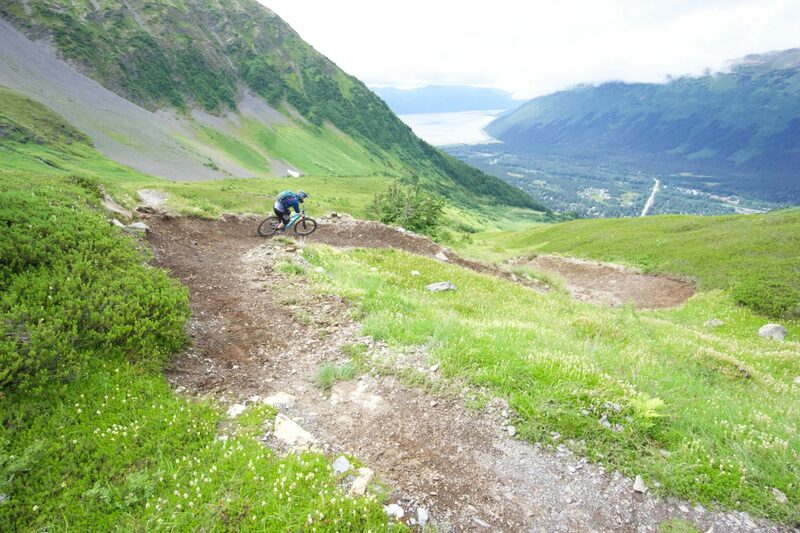 But Mount Alyeska’s bike thrills are not all Girdwood Valley offers to peddle-mad riders. Playfully winding the valley floor (and beyond) are the many trail systems of the valley itself. Those wide spreading networks know a locally popular ally in NPO, Girdwood Mountain Bike Alliance [GMBA]. Kicked off in September 2016, GMBA’s primary goal of enabling single-use valley trail projects is exciting news for ride recreationists as group efforts would translate to regular trail maintenance and increased support overall. The group’s primary focus at present is the much anticipated lower Winner Creek drainage. That project marks the group’s first construction as an organization and exists as an extension from the popular 5K Nordic Ski Loop trail. The undertaking would lend a tailored aspect to an all-season course already favored for its winding, scenic pleasures. The rainforest, deep but not so dark, of Girdwood Valley. “Construction on phase 1 will start this July,” she said. Though focused currently on operations within the Girdwood Valley, GMBA supports similarly peddle-minded group, Single Track Advocates and others at work to improve the mountain biking around the state of Alaska. 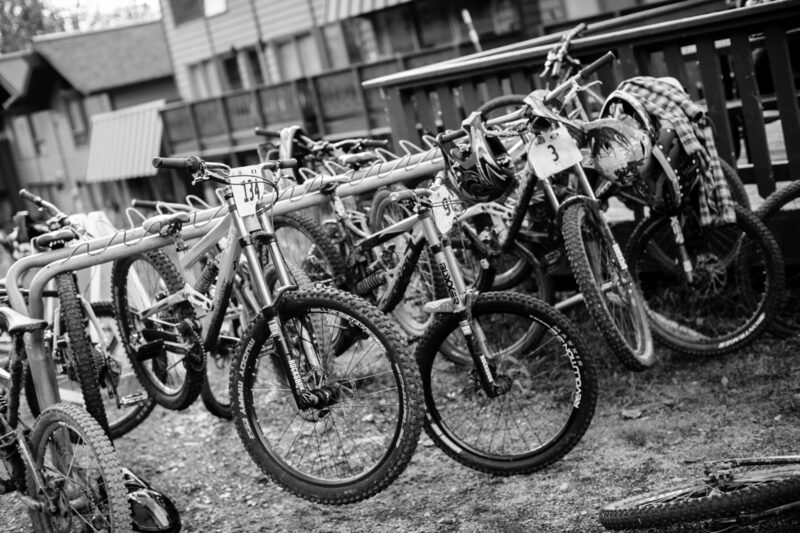 GMBA hopes to continue expansion upon the exponentially growing Girdwood bike culture by providing trails and education to local residents and visitors. These happy aims happen to closely align with those the valley’s sole downhill course: Alyeska Resort. 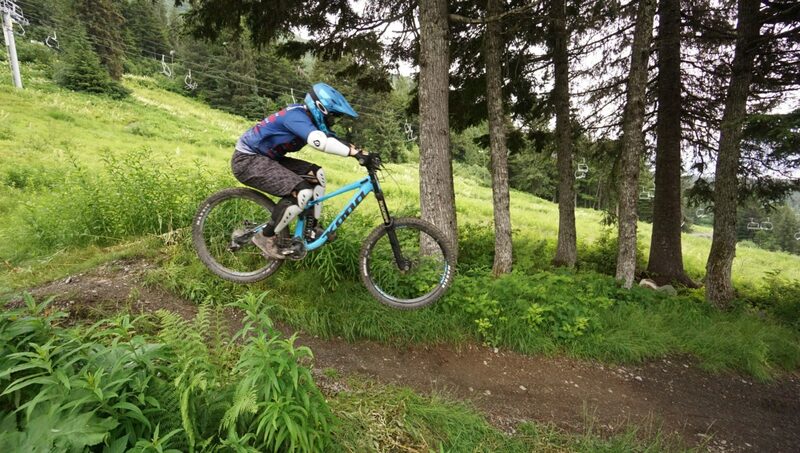 Though, at present, GMBA and Alyeska Resort overlap only as far as their wishes to provide memorable trails for riders Sophie feels, downhill and pedal access to one-way trails will only complement each other and provide more options in the valley. “In the long term, GMBA hopes to become a proactive and productive non-profit that helps grow Alaska mountain biking,” she said. This is a glad tiding for riders as both Alyeska Resort Company and GMBA express future hopes to expand into new multi-use bike trails around Girdwood while maintaining existing trails. And both intend upon breaking new ground summer 2018. Thrill of the trail awaits at Alyeska Resort and Girdwood Valley. “Accomplishing a trail builds confidence in a person, and that is a good thing for everyone,” she said. An avid husband, father, skier, and friend, Paulie writes by the light of a vagabond moon. He appreciates fresh perspective, fine literature, and strong drink.